Philadelphia, August 22, 2018 – Despite increasing awareness about atrial fibrillation (AF), stroke continues to be the first manifestation of AF in some patients. Therefore, early detection and regular heart monitoring are important for such patients. Current monitoring technology devices can be cumbersome, some are limited in duration and others are invasive, and many usually require a trip to the doctor's office. With the rise of smart phone-enabled medical peripherals, a new area of focus is ambulatory detection of AF. A study published in HeartRhythm found that a mobile heart monitor, paired with a smart device and an app, and supported by an automated algorithm can effectively and accurately detect AF, especially when supported by physician overread. The Kardia Mobile Cardiac Monitor (KMCM) is a small two-electrode cardiac rhythm recorder that hooks up to a smart device. It enables patients to record a 30-second rhythm strip. In this study, scientists ran the data collected by the devices through KMCM's new automated rhythm analysis, which uses an algorithm specifically developed to detect AF. Investigators designed the study to directly compare the results obtained from the mobile monitoring to that of a traditional 12-lead ECG recording analyzed by a doctor. AF patients underwent almost simultaneous recording by both the mobile monitoring device and a traditional ECG. When the results were compared, they found that when the conditions were met for the automated rhythm analysis to provide a diagnosis, it had 96.6 percent sensitivity and 94.1 percent specificity for AF detection compared to physician-interpreted ECGs. "This study is the first independent validation of this smartphone monitor system in the clinical setting using near simultaneous 12-lead ECGs," said lead investigator Khaldoun G. Tarakji, MD, MPH, Section of Cardiac Pacing and Electrophysiology, Heart and Vascular Institute, Cleveland Clinic, Cleveland, OH, USA. "In addition to providing an instantaneous rhythm interpretation, this smartphone monitor system is able to transmit a recording to a secure server where the recordings can be directly reviewed." The false negative detection rate was low (3.4 percent); however, the automated system failed to classify some of the results as either "Normal" or "Possible AF." When these results were analyzed by investigators, they found that the majority of these "unclassified" readings fell outside the predefined bounds for the algorithm (e.g., the recordings were less than 30 seconds in duration, the heart rate recorded was under 50 beats per minute [bpm] or over 100 bpm, or that there was too much noise during the rhythm capture). 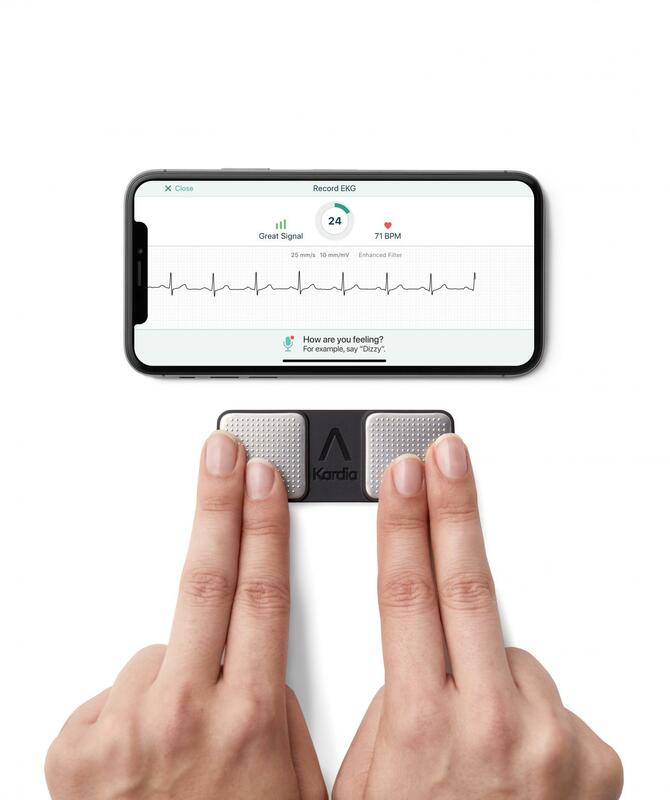 "Given the predefined algorithm operating parameters and high rate of "unclassified" recordings with resultant missed AF instances, this smartphone monitor's algorithm is not suited to be a replacement for physician analysis," noted Dr. Tarakji. "However, given its highly accurate performance when able to provide an interpretation, it holds potential as an adjunct to clinical decision making. Patients can use an automated AF detection as a basis for pursuing additional medical follow-up, and clinicians may use it to develop treatment plans supported by more objective data rather than relying only on symptoms." Study participants found the KMCM device and app easy to use. Having access to a mobile monitoring device also helped ease anxiety related to their AF diagnosis. Investigators hope that in the future, these types of smart device apps and devices will help doctors and patients form more of a care partnership, in which they can work together as a team to monitor chronic conditions like AF. "The ability to record your own rhythm strip and directly visualize it and share it with your physician was fictional up until a few years ago. We live in an exciting era in which technology is evolving at an unprecedented pace. As a medical community, we have a duty to test these products, assess their accuracy, and more importantly, examine their ability to change outcomes. Abundance of data could become noise if it does not come with guidance about proper management of the information. Our obligation through proper clinical studies is to provide guidance about the best use of these tools. As physicians, we should not view these products as threats, but rather as an opportunity to provide better and more effective care for our patients," concluded Dr. Tarakji.